If you are having guests over for Easter, you are going to need a showstopping cake to make itself seen amongst all of the chocolate eggs and their colourful wrappings. 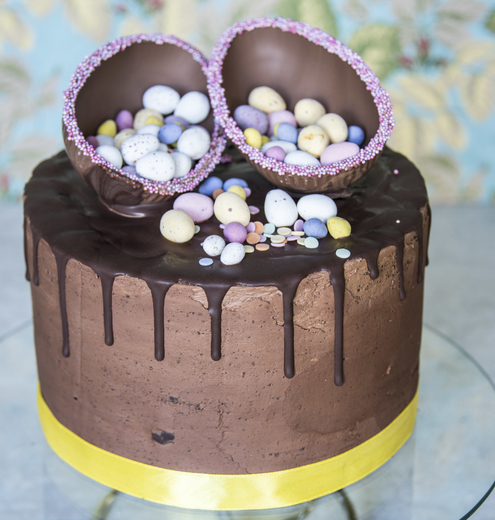 I saw little point in trying to avoid the chocolate theme with this cake – we all know that Easter is the one day that it is entirely acceptable to eat chocolate for and with every meal, and snack inbetween. This cake is a celebration of chocolate with a delightful whipped fudge frosting, which I think you will enjoy. Finish your cake off with a fashionable chocolate drip which is fun and easy to do at home, then throw chocolate at it. I will not be held responsible for any chocolate overdoses that may occur as a result of this recipe! Begin by melting dark chocolate and butter in a large saucepan with coffee granules and water, over the lowest heat that you can, until only a few small lumps remain. Combine flours, Food Thoughts Cacao Powder, bicarb, salt, and sugar in a large mixing bowl. Stir all together into one dry mix. In a jug, fork together eggs, buttermilk and oil until combined. Pour this into the dry ingredients and mix until you have the start of a thick paste. Pour the melted chocolate mixture onto the dry paste and mix to combine into a thick and glossy chocolate batter. Add Food Thoughts Cacao Nibs, which will be like a cross between chocolate chips and nuts when baked into this chocolate cake. Divide the batter evenly between 3x 8” sandwich cake tins, each one lined with baking parchment. Bake in a preheated oven for 45-50 minutes, until a cocktail stick comes out with just a few crumbs but no wet batter attached to it. Allow these cakes to cool completely in their tins before turning out for decorating. To make the Whipped Fudge Frosting, chop the chocolate and set it aside in a heatproof bowl. Gently heat cream and syrup together until just below boiling point. Pour the hot cream mixture onto the chocolate and stir until combined with no lumps remaining. Set the frosting aside to cool, uncovered, in the fridge until room temperature. This should take around 30 minutes. Whisk the cooled filling until light and fluffy. Use this to sandwich your layers of cake together and to cover the top and sides. Aim to get the sides as neat as you can using either a large palette knife or a side scraper if you have one. Pop the cake in the fridge to firm up while you make the chocolate drip. Prepare a dark chocolate ganache by melting dark chocolate in a bowl set over a pan of gently boiling water. Once the chocolate is melted, add unsalted butter a few cubes at a time until all is incorporated. Take your bowl of melted ganache off the heat and allow to cool for 10 minutes before using. You want the ganache to be runny but not piping hot. To create the drip effect, remove your cake from the fridge (hopefully its frosting layer is nice and firm) and carefully spoon small amounts of ganache to drip over the top edge of the cake. Gravity will pull the ganache down the sides of the cake so be sparing. Work your way around the top edge, spooning varying amount of ganache and watching the drips form. Once you have been around the edge, spoon a nice dollop of ganache onto the top of the cake and spread it out to join the edge. 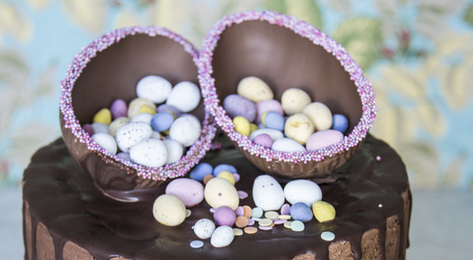 To decorate, stand a small chocolate Easter egg (the kind that comes in two halves) on the top of the cake and create the illusion of smaller treats falling out of its centre. This cake will never look the same twice and I guarantee that your guests will not be able to take their eyes off it at your Easter table!